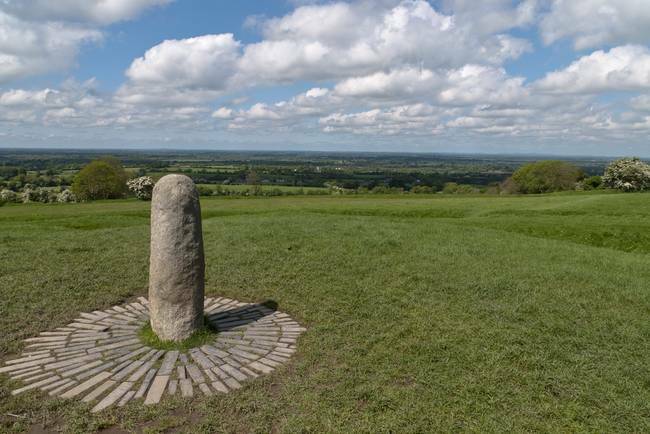 View northwest from Hill of Tara looking across County Meath with views of Counties Westmeath and Cavan. On the horizon, right, is Hag's Mountain, (Irish: Sliabh na Caillí) , site of the Loughcrew Cairns. The standing stone is the "Stone of Destiny: (Irish: Lia Fáil), which served in coronation the coronation of the High Kings of Ireland. It stands on the Inauguration Mound (Irish: an Forrad) of Tara. This photograph was taken the morning of May 27, 2014 hours before the stone was vandalized, doused with green and red paint.